At 88 years old, Donald Brazones’ memory may be slipping on a few dates and the exact order of some events of his life, but there is one day in particular that he will never forget. “I remember every single moment of that day,” Brazones said, becoming serious after just moments earlier sharing pleasant stories of life on the Air Force base in England where he and his crew were stationed during World War II. “I went on 17 and-a-half missions,” Brazones said. Eight months to be exact. Brazones’ aircraft was shot down over Germany and he was captured by the enemy in September 1944. He was taken to a prisoner of war camp in Barth, Germany, on the Baltic Sea, where he nearly froze and starved to death before the Russian Army liberated him and more than 7,000 other prisoners the following year. To sit next to this kind and cheerful gentleman in his comfortable living room in Petoskey and hear his story of how incredibly close he was to dying at the age of 20 fills the listener with a deep sense of reverence. 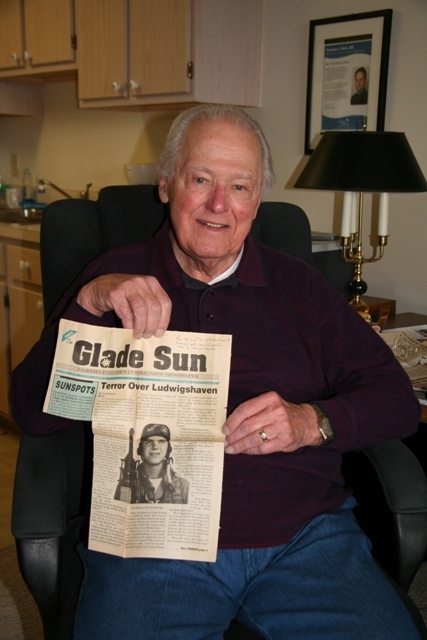 Donald Brazones, Second Lieutenant in the U.S. Army Air Corp, holds an article from “The Glade Sun” community newspaper in Fairfield Glades, Tennessee, from Oct. 6, 1994 featuring him and his story of service to his country. Brazones begins his story on Dec. 7, 1941, the day the Japanese bombed Pearl Harbor. He and two of his buddies at Washington Park High School in Racine, Wisc., decided they were going to join the Marines and “go fight Japs.” Brazones was 17 years old. He went home from school that day and proudly told his plans to his parents. They said, “Absolutely not,” Brazones said, laughing. His parents told Brazones that he was going to finish school first and get a diploma. After that, he would be free to join the service if he wished. Those two friends of his did join the Marines. One served as an MP (military police) in Honolulu, Hawaii; tough duty, Brazones laughs. The other, a real “go getter,” joined the Roosevelt Raiders and went on missions in Europe, Brazones recalled. The following June, 1942, Brazones graduated from high school. He enlisted with the U.S. Army Air Corp (later in the war it became the U.S. Air Force) and completed his basic training at Jefferson Barracks, St. Louis, Missouri, where it was hot, Brazones remembered. “I learned how to march a lot,” he said. He then signed up for armament school in Denver, Colo. where he was trained to load and unload bombs, machine guns, and other weaponry. “I could take a machine gun apart and put it back together blindfolded,” Brazones said. At one point in his early training, Brazones watched B-17s and B-24 bomber planes take off and land and he thought that looked exciting. When he was in Santa Ana, Calif., for Classification School (where the military determined if a soldier had the skills to be a pilot, navigator or bombardier) Brazones told those in charge that he wanted to be a pilot. The review board told him he was classified as a navigator, a position that required extensive math skills, which he possessed. “I told them I wanted to be a pilot,” Brazone insisted. The review board asked him why? He told them he wanted to fly the big bombers. They asked him, “Where do you think you navigate them from, the ground?” He was informed that if he didn’t become a navigator, his only other option was to join the infantry. Brazones gladly became a navigator, going to the Army Air Corp Navigation School in Hondo, Texas. After graduating from Navigation School, Brazones received his commission as a Second Lieutenant and proudly earned his “Wings” as an Aerial Navigator. He was then assigned to the Army Air Field in Ardmore, Oklahoma, and became a member of a combat crew to fly a B-17 bomber (the same airplane depicted in the movie “The Memphis Bell”). The crew consisted of a pilot, co-pilot, navigator, bombardier, flight engineer, radio operator, waist gunner, ball turret gunner, and the tail gunner — nine men all together. “For about a month we flew practice missions to learn to work together as a crew, especially formation flying and bombing practice,” Brazones said. They named their plane after Brazones’ suggestion, “Heavenly Bodies,” in honor of the stars above. On March 6, 1944, Brazones departed Ardmore, Okla., and went to Kearney, Neb., for assignment to a theater of operations. He is able to retrieve specific dates and events from a “combat diary” he kept while serving in the Air Corps; after each mission, he wrote down his experiences. Forty-eight years after the war, the diary was typed up and reflections were added to it by Brazones. In Kearney, he and his crew were assigned to the European Theater and the port of debarkation would be Fort Kilmer, New Jersey. “They told us we would be riding on the Queen Mary to England,” Brazones said. When he and the crew marched down the docks, they saw the Queen Mary, gleaming in the sun. They were marched past her to a much smaller and less flashy troop ship. He and the other men were more than a bit disappointed. The troop ship left the U.S. on April 24, 1944 and took two long weeks to cross the Atlantic. Destroyers cruised up and down the convoy of troop ships, protecting them from enemy submarines. On May 6, 1944, Brazones arrived at Liverpool, England. There he was assigned to the 91st Bomb Group and stationed at Bassingbourn, 15 to 20 miles southwest of Cambridge. Bassingbourn had former been Royal Air Force (RAF) base and was a well-established base with permanent buildings and impressive facilities. 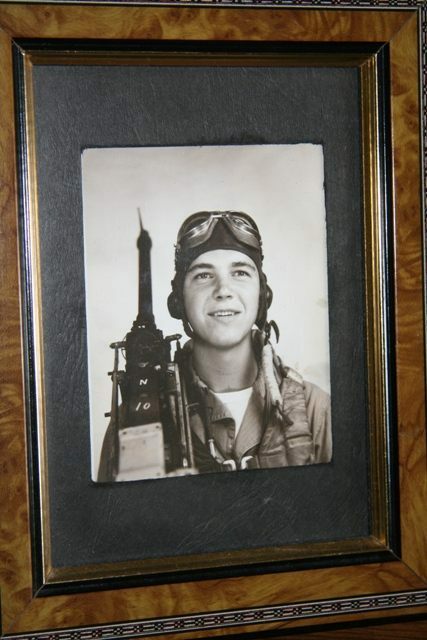 “The only thing wrong with it was you had to get up and fly a mission every day or every other day,” Brazones said. His first combat mission was on June 3, 1944. His combat diary details aspects of preparation for a mission, such as going to the equipment room to get high altitude suits (temperatures reached 20 to 30 degrees below zero at 25,000 feet, the usual bombing-mission altitude). The bomber crews also collected their parachutes, flak (anti-aircraft shells) jackets, helmets and sun visors before each mission. That first mission was what the military called “a maximum effort.” Fifty-four planes from his group were in the air flying in close formation across the English Channel. The target was one gun implacement on the Normandy coast. The following mission was two days later, June 5, 1944, with the target once again being guns built into the hillsides of the Normandy coast. Brazones’ combat diary reads, “A whole wing went out to destroy three artillery guns – they must be important!” The mission was routine and uneventful. He found out the following day just how important were those guns. June 6, 1944, his third combat mission, was D-day, the invasion of the beaches at Normandy, “Festung Europa” — Fortress Europe — Brazones wrote. When he and his crew members were awakened in the early morning for a briefing, they were told, “This is it!” Everyone was excited. The plane was loaded with 38 bombs weighing 100 pounds each. “There were more airplanes in the air than anyone could imagine,” Brazones wrote in his diary. He estimated 11,000 airplanes filled the sky, flying back and forth across the English Channel. His only disappointment was the overcast sky that day, preventing him from having a good view of the flotilla of ships and destroyers below. He was able to catch a few glimpses between clouds. “Our target that day was to obliterate the enemy with fragmentation bombs (filled with small pieces of metal that would fly in every direction upon explosion),” Brazones recalls. Their mission was to drop the bombs on the beach and then string them out inland, with plane after plane repeating this mission. “So you can imagine what a hell that was down there,” Brazones said, showing sympathy for soldiers on the ground. After his crew dropped their bombs, they were ordered to fly back to the base in England, refuel and reload, and stand-by to possibly do it all again. He can remember how fired up the crew was, how elated they were to finally be making an effort toward pushing the Germans back. But the order never came. As he describes it, the B-17 bomber had a Plexiglas nose cone where the bombardier sat up front. The navigator sat directly behind the bombardier, turned sideways in the bulkhead with his right side facing forward. Brazones felt vulnerable in this clear plastic fish bowl. He would use his rolled up parachute, in its pack, as padding against the risk of flak (anti-aircraft shells) coming through the Plexiglas by releasing one of the parachute’s rings from its clip on his chest and tucking the packed chute along his right side. In this position, the chute was also out of his way as he leaned over his small navigation desk. Brazones spent a lot of time thinking about his position in the bomber and how he would escape if they were ever hit by enemy fire. He practiced over and over clipping his parachute to its left side ring, slipping out of his flak jacket, and how he would slide out of his chair and down through a hatch in the floor to his left. He felt he had to develop a preservation plan after watching planes all around them in formation getting shot down on each mission. On June 25, 1944, after his 13th mission, Brazones consented to allow another navigator to take his place on Brazones’ plane. The other navigator had completed 24 missions and needed one more to complete his first tour of duty. “This was a sad day,” Brazones’ diary tells. “Only one plane didn’t return from operations, and it had to be mine.” His plane was hit and they lost an engine, but Brazones found out later that they were able to crash land in Spain. All survived, but it would take them weeks to return to the base. Meanwhile, Brazones was an orphan, a navigator without a crew. His missions became further spaced out. He spent a lot of time at Cambridge reading books in the library. Mission 17 was the last one recorded in his diary. Years later, he completed the tale, filling in where the diary left off. On Sept. 8, 1944, he was awakened for his 18th mission very early, an indication that this would be a long flight. He had his breakfast then went to the room set aside to see the chaplain and receive Holy Communion, but the priest never showed up. This made him begin to feel anxious. Looking back, Brazones said he had a premonition that morning, an undeniable feeling that he would not be coming back. While in the equipment room to get his high altitude suit, the zipper broke on one of his boots. Instead of turning them in for a new pair, he simply took out the leather string which was on the zipper pull tab, and wrapped it around the boot to hold it on. “The thought went through my mind that it made little sense to get new boots because I wouldn’t need them after today,” Brazones said. He took extra care to make sure his parachute harness fit perfectly. He adjusted and readjusted all the straps so they fit tightly around his legs and chest. Once in the plane, he made certain that his chest pack was stowed within arms reach so that he could grab it easily in case he needed it. He was distracted and nervous on the flight. He was preoccupied with plans for survival. He practiced putting on and taking off his flak jacket. He attached the right ring of his parachute to allow it to hang down his right side. He practiced attaching the left ring over and over. The target was a factory in Ludwigshaven on the Rhine River in Germany. The sky over the target was black from exploding flak. Brazones’ crew began their bomb run, and the flak became heavier and more intense. The pilot said, “Navigator, be sure to get pictures of some of this close flak.” At that instant, there was an explosion and a big puff of black smoke right in front of their nose at their exact altitude. For a brief moment, as if in slow motion, the plane maintained its altitude, but it felt as if the pilot had applied the brakes. In that instant, Brazones performed the motions he had practiced countless times. He pulled the tab on his flak suit, ripped the oxygen hose and communication lines from his head, flipped up his chute to engage the second hook, and leaned back to get out the escape hatch. But the plane suddenly dropped violently to the right, fell into a nose dive, and began to spiral toward Earth. The plane was flying at 25,000 feet before it was hit. The centrifugal force caused by the spinning and falling plane threw the bombardier, Frank Bolen, and Brazones up against the Plexiglas, pinning them against the clear nose cone. They were helpless and couldn’t move as they spiraled toward the ground. “I knew I was going to die, and yet I wasn’t afraid,” Brazones said. He said his last prayer. Thoughts of how sad his parents would be to find out he had been killed went through his mind. He even had time to wonder if it would hurt when they hit the ground. He suddenly felt tremendous pressure against his body, and the next thing he knew he and the bombardier were hurling through space, free from the falling plane. The pressure he felt was the plane exploding, pushing the plastic nose cone completely off the front of the aircraft. Now his training kicking in and he repeated what he had been taught, “Delay your jump,” meaning, wait to pull his parachute’s rip cord so that his chance of detection and capture would be less. When he saw another parachute above him, he thought, “That’s enough delay,” and he pulled his rip cord. The wind blew him away from the flames and toward the middle of the Rhine River. Just before hitting the water, he pulled the cords to inflate his “Mae West,” an inflatable life preserver they wore around their neck and chest. As soon as he hit the water, he swam out of his parachute harness and the chute blew across the river. He bent over and unzipped one boot, then pulled the broken leather string off the other. His early morning premonition had come true: He would not need those boots again. He swam to shore and was amazed to discover that the entire shoreline of the river was covered in bricks. He looked up the bank and saw a man motioning to him to follow. He crawled up the bank and without a spoken word, followed the man into an underground bunker. Brazones’ assumption was that they were in a bomb shelter for workers at the factory. Soaking wet after being shot out of the sky, now alone in enemy territory, Brazones was 10 feet underground the target area that was still being bombed by his own countrymen. The man who led him to the bunker didn’t speak English. Brazones thinks he was Polish and that he may have been a slave laborer of the German-run factories. The man left and soon returned with other men. Attempts to communicate resulted in Brazones understanding that at a certain hour, he and one of the men would go up a ladder and escape. When the time came, they climbed up the ladder only to be met with guns pointed at them by what looked like little children with rifles taller than them. “Hitler Youth” he later learned. German officers appeared and marched Brazones down a street and eventually they ended up in an underground office complex. After a brief interrogation in which Brazones revealed his name, rank and serial number, he was turned over to a young member of the Luftwaffe. “Even though enemies, there was a mutual respect among air force personnel,” Brazones wrote. They went above ground, boarded a train, but it was full of people so they rode on the platform. His clothes were still wet and he began to get chilled. He was taken to a hospital where a physician examined him. He had no serious injuries. He was kept in a cell with a bed overnight. In the morning, he awoke to the sound of air raid sirens. The door flew open and the Luftwaffe guard motioned for him to follow. They ran out of the building, across the street, into a basement. Bombs fell for quite some time. The noise was deafening. Waves of bombers came over and dropped their loads. Brazones thought now he was going to die from bombs from his own Air Corps after surviving the prior day’s ordeal. After the bombing stopped, he and the guard left the basement and the guard flagged down a passing car driven by a Whermacht officer. They eventually boarded a train and traveled for many hours. He was delivered to an interrogation center that he thinks was near Frankfort. After a few days, they left that building and Brazones ended up at Dulag Luft in Wetzlar, Germany, a prisoner of war distribution center. It was his first opportunity in more than a week to get a shower, brush his teeth, and eat decent food. He also received a box from the American Red Cross. It contained some personal items: toothbrush and paste, comb, toilet tissue, and a knitted sweater. He treasured that sweater all during his confinement. The next three of four days were spent in a prisoner car on a train headed for Stalug Luft No. 1 in Barth, Germany, on the Baltic Sea. The train car had bars on the windows and guards at the doors. When they got caught in bombing raids, the guards would lock the doors and run for cover. Brazones and the other prisoners would lie on the floor and pray they weren’t hit. His diary ends at this point, September 1944. Brazones doesn’t talk much about his eight months in the prisoner of war camp, other than to say that he remembers being cold, and “hunger, always hunger.” He and 20 other men lived in a room maybe 10 feet by 15 feet, with bunk beds originally. Later, another level of beds was added to make the bunks sleep three men. A small wood burning stove was their only source of heat, cooking and light. “We ate, slept, fought, did it all in that one room,” Brazones remembers. At first the German guards would bring potatoes and rutabagas and the occasional Red Cross care package with Spam, chocolate bars, and cans of oleo (early versions of margarine). As the war dragged on, food became scarce for even the enemy, and the Germans began keeping the Red Cross care packages for themselves. Prisoners were left to fend for their food. Brazones was thin and weak, sick with pneumonia or bronchitis, he said, by the time the Russians liberated them on May 7, 1945. The prisoner camp was near an air strip. Huge bomber aircraft were flown in from England and France, loaded up with freed prisoners, and flown back to allied bases. Eventually, Brazones was headed home on one of many liberty ships. Upon returning to the States, Brazones went to college at the University of Madison, Wisconsin, where he met the love of his life, Margaret Lorraine. Barzones graduated with his engineering degree and secured a job with Oscar Meyer. He told them he couldn’t start for another week, because he was going to get married (now that he had a job) and go on his honeymoon. They married in September 1949, and Brazones went to work, like so many other men of his time. He and Lorraine had four children; two boys and two girls. Over the years they moved around a bit, living in Minneapolis, Minnesota; Rockford, Illinois; and Fairfield Glade, Tennessee. Their daughters wanted their parents closer to them when Brazones retired, moving them to southern Michigan about 10 years ago. Two years ago, their youngest daughter, Dr. Peggy Brazones, an orthodontist, moved her parents to Petoskey. Sadly, Lorraine passed away last year. They were married for 63 years. Don is busy these days keeping in touch with his eight grandchildren. After the war, Brazones got in touch with the bombardier, Frank Bolen, who lived in Alabama. Brazones visited him a few times. He also took his wife to France and German shortly after the 50th anniversary of D-day. They retraced his steps from all those years ago, seeing where he was shot down, and even visiting the place where the prisoner of war camp once stood. All that remains today is a plaque marker. The Russians immediately tore down the barracks after the liberation. Sixty-eight years later, Brazones marvels that he will be 89 in January, and that so much has happened since he came so close to dying at the young age of 20. “The amazing thing is that we were all just kids back then,” Brazones said. Stalag Luft I, a prisoner of war camp for Air Force officers) was situated in Barth, Germany, a small town on the Baltic Sea. First opened in October 1942 as a British camp, the Red Cross visited the camp in February 1943 and two American officers had arrived. By January 1944, 507 American Air Force officers were detained there. The camp grew rapidly and in 1944 the Red Cross reported 3,463 inmates. New compounds were opened and quickly filled. Nearly 6,000 POWs were crowded into the camp in September 1944, and at the time of the liberation of the camp in May 1945, there were 7,717 Americans and 1,427 Britons crowded into the camp.